Find out how to build smarter machine learning systems with R. Follow this three module course to become a more fluent machine learning practitioner. 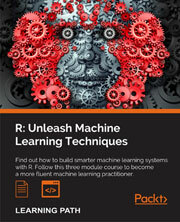 This Learning Path will take you through the fundamentals of R and demonstrate how to use the language to solve a diverse range of challenges through machine learning. Accessible yet comprehensive, it provides you with everything you need to become more a more fluent data professional, and more confident with R.
In the first module you&apos;ll get to grips with the fundamentals of R. This means you&apos;ll be taking a look at some of the details of how the language works, before seeing how to put your knowledge into practice to build some simple machine learning projects that could prove useful for a range of real world problems. For the following two modules we&apos;ll begin to investigate machine learning algorithms in more detail. To build upon the basics, you&apos;ll get to work on three different projects that will test your skills. Covering some of the most important algorithms and featuring some of the most popular R packages, they&apos;re all focused on solving real problems in different areas, ranging from finance to social media. This is an enticing learning path that starts from the very basics to gradually pick up pace as the story unfolds. Each concept is first defined in the larger context of things succinctly, followed by a detailed explanation of their application. Each topic is explained with the help of a project that solves a real-world problem involving hands-on work thus giving you a deep insight into the world of machine learning.